Modern roofing materials are beautiful and durable, no one will argue. However, the good old slate is also not stale on store shelves. After all, it is very cheap, not afraid of fire, and other technical characteristics are not bad. For the roof they use only wave slate, the dimensions of which allow covering practically any roof with a minimum of waste. The main thing - that the slope of its slope was not less than 12 degrees. It is about the size of the wave and flat slate and will be discussed in this article. 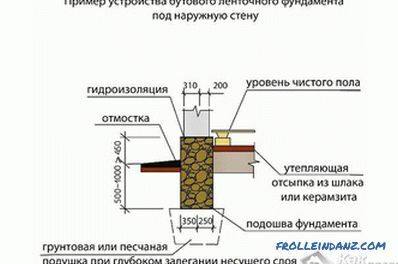 Flat slate for roofs is not very suitable. 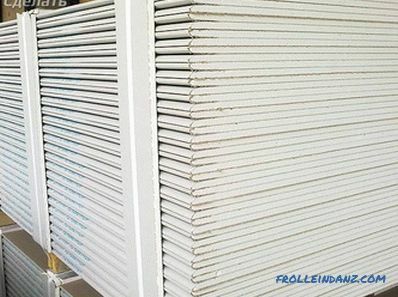 As a rule, it is used for wall cladding or installation of partitions in farm buildings. 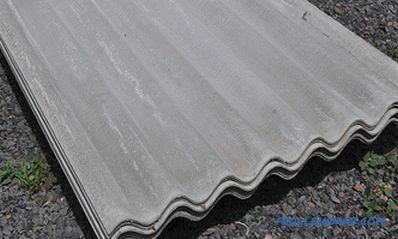 Slate sheets with a wavy profile (consisting of five, six, seven or eight waves) are produced according to GOST 30340-95. However, some manufacturers make this coating according to their own specifications (specifications). This is allowed, but in this case, the size of the sheet of wave slate may differ from the standard. the height of the wave crest. Slate grade 40/150. Its wave step is 15 centimeters, and the height of the wave crest is 4 centimeters. Slate grade 54/200. Wave step - 20 centimeters, height - 5.4 centimeters. # 1. 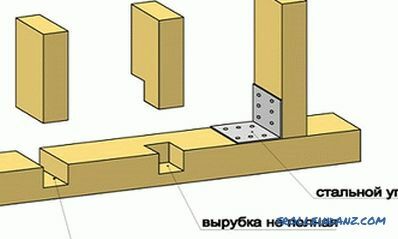 The unified profile with the abbreviation HC is the most economical material. Waste when using it is the smallest. It is often used as a roof for residential buildings. # 2. Profile ordinary, abbreviated VO. # 3. 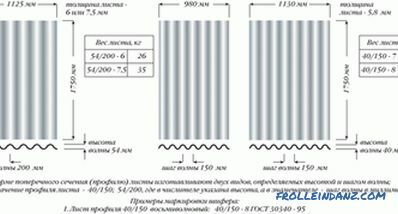 The profile is reinforced, abbreviated VU, has a greater thickness (8 millimeters). 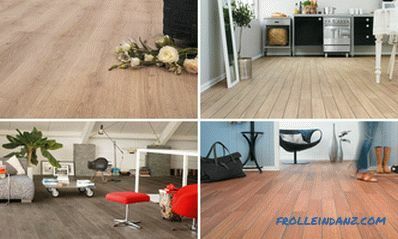 Therefore, it is mainly used for industrial facilities. length - up to 2.8 meters. For a roof of a summer house or a small house (up to two floors), such a slate is iobretayut often. After all, the useful area of ​​sheets it does not differ very much from their full area. Because the standard overlap, constituting one or two waves, is small compared to the total size. By the way, for the convenience of overlap slate waves, located on the edge, have a slightly different size than the average wave. GOST allows for this. In both of these slate types, wave crest height (4 centimeters), its pitch (15 centimeters), and sheet thickness (5.2 or 5.8 millimeters) are common. These parameters must comply with GOST 30340-95. The remaining dimensions of the slate sheet are different. 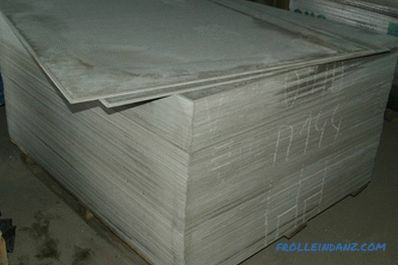 These types of slate and often cover various premises for production needs, such as warehouses. But in the private construction of their use unprofitable. The fact is that the size of the 8 wave slate is exactly the same as that of the 5 wave. As a result, taking into account the overlap, the difference between the total and the real area of ​​the roof is too large. As a result, we obtain a significant overrun. The thickness of this roofing material is about 7.5 millimeters. Thicker slate (7.5 millimeters) breaks down much more when bending and does not collapse so much during shocks and loads. And it can withstand a negative temperature two times lower than thin slate. 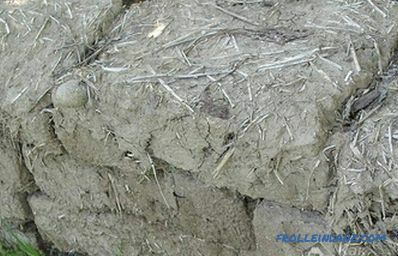 length - 1.5 meters, width - 1 meter. However, sheets with a length of 1.75 and a width of 1.13 meters are most popular. Their most demanded thickness is 10 millimeters (the sheet weighs 40.1 kilograms), 8 millimeters (weight 30.5 kilograms) and 6 millimeters (weight 21.2 kilograms). Measure the roof length, and then divide this number by the width of the slate sheet. Taking one-tenth overlap, find out how many sheets we need for one row. And the distance from the base of the ridge of the roof to its lower overhang should be divided by the length of the slate sheet. Here we will add not 10, but 13 percent to overlap. Round up - here's the number of rows. Just in case, always buy a couple of sheets more than calculated.